So have our southern rivers been low of recent or what? So many people are complaining about fish being too hard to catch, but on closer inspection it usually comes down to angler error or failure to capitalize on the conditions. In these low clear conditions 4x simply wont cut it. We are talking 6lb here on rather educated, sometimes specific feeding trout. Now I don’t believe trout see the tippet and refuse on this alone. They do not know what monofilament / fluorocarbon is, but larger diameter tippet presents a larger surface area, and surface friction / drag on this heavier nylon is far more pronounced. 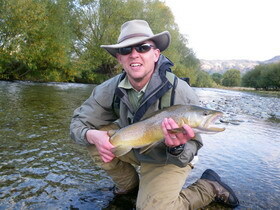 Trout DO know how a fly should behave! I prefer a soft brand of nylon, something supple, which will move around freely within the various currents with ease. We can often see the main current and edge waters easily enough, but not so often the many micro currents pushing and pulling in umpteen directions. A soft brand nylon in 5x or 6x does the job for me, and works within these currents with minimal effect on ones drift. Leader length also is something to be carefully considered. You simply do not get a lot of wiggle room in a typical 9’ leader. I prefer the longest leaders I can manage, and better still if they do not completely turn over. Think about this – Our goal is to present a fly to the trout in the most natural way possible. Thrown into the mix is our ever-present nemesis, drag. We must get that fly drifting drag free to deceive these fish. If our leader piles up when presented, all that slack line must straighten out in the currents before our fly gets whipped along behind. More slack in the leader = longer drift! The easiest way to achieve this is to either soften down the taper in your leader or by simply attaching a super long tippet, one that is guaranteed to pile up. Add a reach cast or other slack line presentation into the mix and the trout are yours! Now we have our leader set up correctly lets take a look at those size 14 kakahis! You have to imitate what is coming off the water, particularly in low water conditions. Kakahis represent the adult colorburiscus, a larger, rather colourful mayfly most commonly found on the Mataura pre xmas, and in other bush lines hill country streams of the region. Right now they are focussing on the Mataura trouts bread and butter, the ever-prolific Deleatidium. These blue grey duns are best represented by flies of the adams genre, and we all know my penchance for low riding, damp / dry imitations. As long as you match the size, silouhette and behaviour of the natural, you are in the money. So, at present ones best bet is with flies in the size 16 through 20 range. Deer Hair Emergers, wee CDC’s, para adams and the like occupy my fly box at the moment, and takes are forthcoming. Nymphs too should be in the smaller size range, with size 18 being my norm. As water temperatures rise over the summer months, invertibrete mature earlier than in the cooler months of spring, and so hatch out whilst still at a relatively small size – those size 12’s and 14’s which served you so well pre xmas must now take the back seat. Think small and dark when considering Mataura nymphs over the next month, and ensure you carry a variety of weights. Lets now take a look at presentation. In such low, clear water dropping the tippet across the trouts window of vision is sure to alarm him. Upstream presentations will often put up more fish than they’ll deceive. I like to get directly across from the fish where possible and land the fly upstream and to my side of his position. This way, the leader and line drop away from the fish, and the fly is the first thing to come within sight of the trout. In many places however, an across stream presentation is not an option, maybe because of an exposed beach, super calm, clear water, or other factors where the trout will see you. I then angle myself downstream but out to the side to reap as many of the benefits possible of the aforementioned across stream presentation. 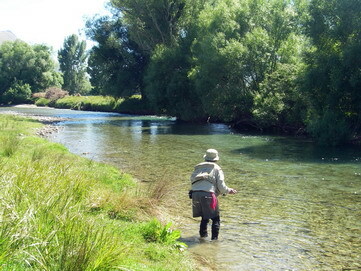 An upstream reach cast will also assist in getting that line well out to the side of the fish – a presentation technique well worth practising. Over the course of the season I notice anglers striving to lead the trout by quite some distance. Many will attempt to drop that fly as much as a couple of rod lengths upstream of the fish. This is good and well in that the trout will not see the drop of the fly, but when positioned just beneath the surface the trouts window of vision isn’t that large. By the time ones 20’ lead drifts down into the bingo zone, all those mixed currents have had so much time to wreck havoc on your drift, the fly is probably dragging as it passes your quarry. With the combination of a long, fine tippet, as across stream presentation as possible and confidence in ones fly placement, I would recommend dropping the fly but a metre or so above the trout, maximum. Believe in your fly placement, focus on where you want to drop the fly, not on the fish, and hand eye coordination will do the rest! The fly is drifting naturally, the leader is piled, straightening gradually within all those micro currents and the trout is lifting towards your dry…. What happens next is up to you!